Fashioned from a lightweight double knit micro textured poly fabric, this 5-button ladies' henley t-shirt is very well constructed. The converstitching is of a contrasting color & is sewn everywhere which lends a subtle design element and adds greater durability. 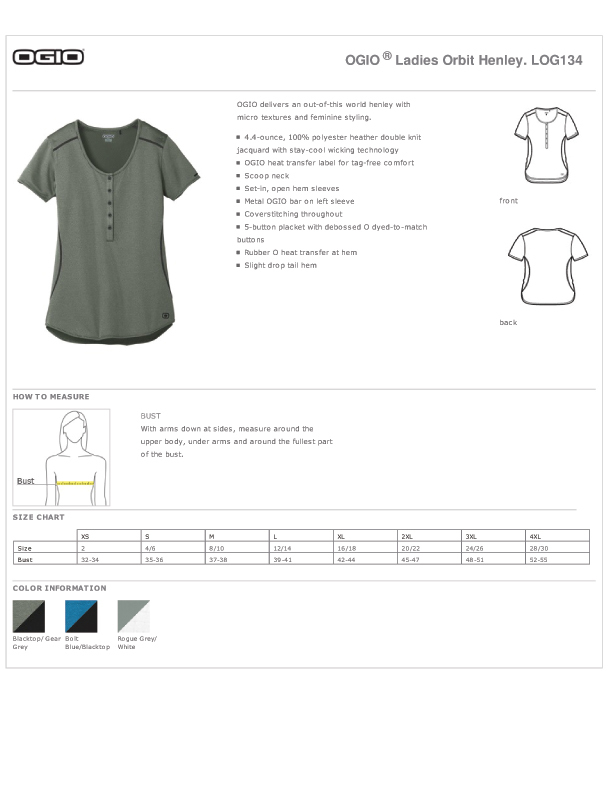 There are five buttons on the placket under the scoop neck and are decorated with a debossed O, buttons that are dyed to match the fabric. Sleeve hems are open and the bottom hem has a slight drop tail. This beautiful woman's tee is decorated on the left sleeve with a metal Ogio bar. Sizes range from extra small to plus 4xl. Let our size chart help you determine the best fit.